Aesthetic crown lengthening is a cutting-edge periodontal technique that can be used to improve a gummy smile. A gummy smile is caused by excessive gum tissue which covers the teeth creating a short and child-like appearance. At their Brentwood office, Dr. Aalam and Dr. Krivitsky perform aesthetic crown lengthening to provide their patients with a natural looking, fuller smile. 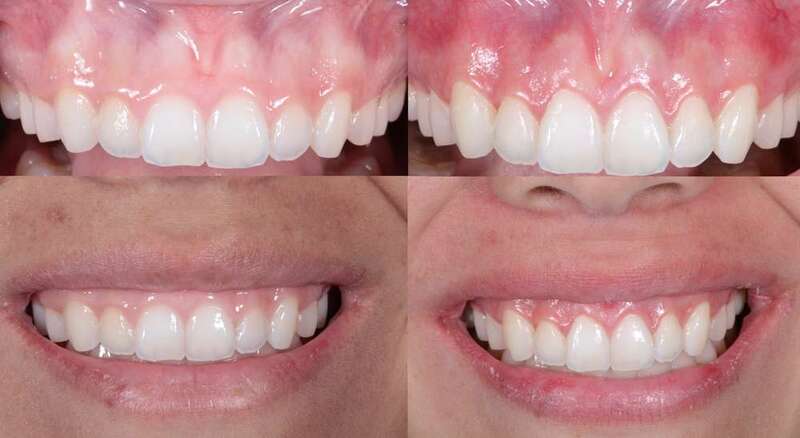 The procedure removes excess gum tissue to reshape the outline of the gums and realign the gum line to expose more of the tooth, creating a fuller, more attractive smile. The procedure can also be done in preparation of dental crowns and other restorative periodontal procedures. Aesthetic crown lengthening is a surgical procedure that involves removing excess gum tissue, and re-contouring the gum line to expose more of the natural tooth. When preparing for dental restorations in the case of functional crown lengthening, the underlying bone may be modified to allow your periodontist to place a permanent restoration such as a crown. Aesthetic Crown lengthening is normally performed under local anesthetic and IV sedation. The duration of the procedure will depend on how many teeth are being treated and whether any amount of bone needs to be removed along with the soft tissue. Once the periodontist achieves an aesthetically pleasing crown length, the treated area is cleaned and restored to an ideal appearance. Due to the IV sedation benefits and the medication prescribed after the procedure, recovery from aesthetic crown lengthening is usually very easy and smooth. Typically, patients will be asked to ice the area for 24 hours and to take a light anti-inflammatory for few days. A custom post-operative regimen will be given to patients based on their personal treatment needs. During the first few days after the procedure, Dr. Aalam and Dr. Krivitsky recommend that patients eat bland, soft foods, and avoid consuming anything too hot. Patients should also refrain from drinking alcohol and engaging in strenuous physical activity (such as going to the gym or lifting weights) to prevent excessive bleeding. Q: What is aesthetic crown lengthening? A: Crown lengthening is a procedure where gum tissue and/or the bone surrounding a tooth is removed in order to expose more of the tooth’s crown (the visible portion of the tooth). Q: Why is crown lengthening recommended? A: Crown lengthening can be recommended for several reasons: 1) for an aesthetically-pleasing smile, 2) to expose more of the tooth in order for your dentist to place a crown, 3) to expose an area of decay below the gum line in order to perform a filling. Q: When correcting my gummy smile, why should I choose aesthetic crown lengthening over Botox? A: Aesthetic crown lengthening and Botox have different indication bases on the proper diagnosis of why you have a gummy smile. Botox treats gummy smiles that are related to a very strong upper lip muscle displaying the gums (known as “hyperactive lip”). Botox will neutralize the lip muscle and let it drape down, covering the teeth in the process. This usually must be repeated every six months, unless you decide to have Dr. Aalam or Dr. Krivitsky surgically correct the lip position with a simple and painless in-office procedure (surgical lip repositioning). Aesthetic crown lengthening treats gummy smile that are caused by short teeth that are covered by too much gums. During your initial consultation, Dr. Aalam and Dr. Krivitsky will determine the cause of your gummy smile and decide on the most cost-effective and risk-effective way to treat it. Q: How long will I feel pain after my surgery? A: For most patients, there may be some discomfort for 2-3 days following their crown lengthening surgery, which can be managed with aspirin-free oral pain medication. A: Typically, you will be able to return to work after one or two days after your procedure. It is recommended to avoid heavy lifting or working out for at least 3-4 days to allow your body to heal.